Seiko LLW-8BL /CS Long arm, heavy duty single needle lockstitch sewing machine with bottom feed, needle feed, walking foot top feed and large capacity vertical sewing hook for use with medium to heavy weight fabrics. 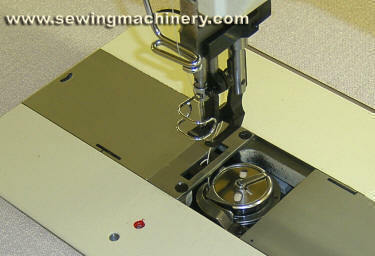 The machine features a long arm clearance from the right of the needle of approximately 18" (458mm) and is used when a standard arm machine is not big enough. A longer stitch length of 10mm is available together with reverse stitching and a hook safety clutch; which helps to prevent damage should the machine be jammed and overloaded etc. 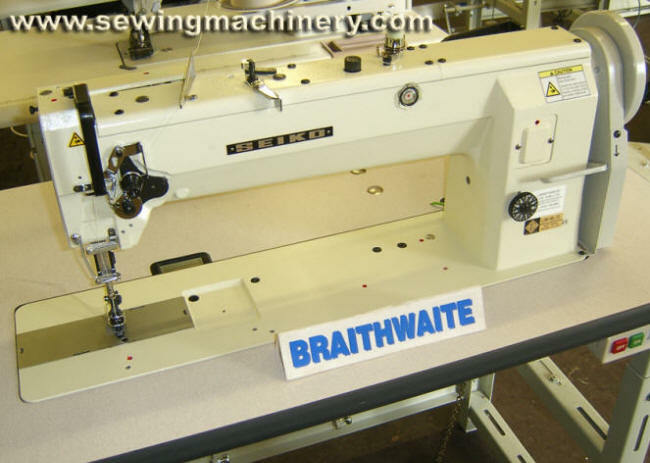 Suitable for sewing material such as canvas, leather, vinyl, general upholstery fabrics, tents, awning, tarpaulins etc. A special long and high arm model LLWH (pictured above) is also available for customers who require extra under arm height. LLWH-8BL/CS: Special High arm version.